In palmistry, the thumbs denote strength of character and ego and the non-verbal use of thumbs agrees with this. They are used to display dominance, superiority or even aggression; thumb gestures are secondary gestures, a supportive part of a gesture cluster. Thumb displays are positive signals, often used in the typical pose of the 'cool' manager who uses them in the presence of subordinates. A courting man uses them in the presence of a potential female partner and they are common among people who wear high-status or prestige clothing. People wearing new, attractive clothing use thumb displays more frequently than those who wear older, outdated clothing. The thumbs, which display superiority, become most obvious when a person gives a contradictory verbal message. 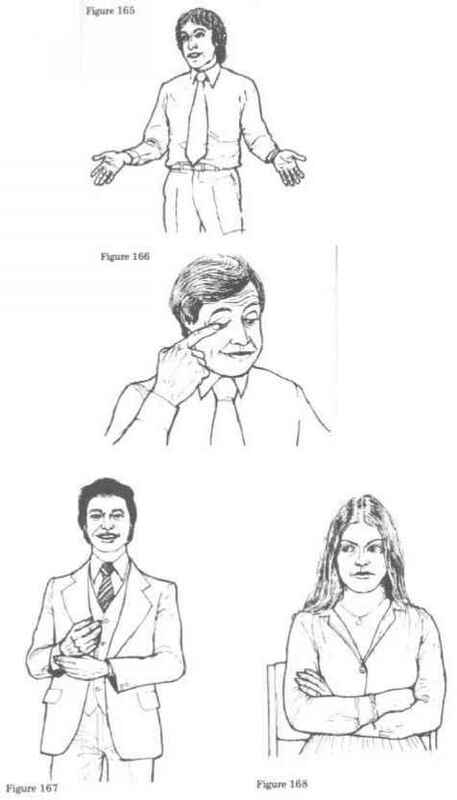 Take, for example, the lawyer who turns to the jury and in a soft, low voice says, 'In my humble opinion, ladies and gentlemen of the jury ...' while displaying dominant thumb gestures and tilting back his head to 'look down his nose' (Figure 48). This has the effect of making the jury feel that the lawyer is insincere, even pompous. If the lawyer wished to appear humble, he should have approached the jury with one foot toward them, his coat open, an open palm display and stooping forward a little to show humility, or even subordination to the jury. 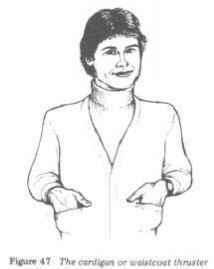 Thumbs most often protrude from people's pockets, sometimes from the back pockets (Figure 49) in a secretive manner to try to hide the person's dominant attitude. 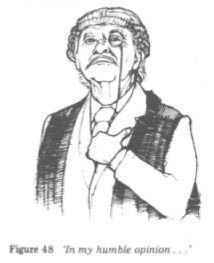 Dominant or aggressive women also use this gesture; the women's movement has allowed them to adopt many male gestures and positions (Figure 50). In addition to all this, thumb thrusters will often rock on the balls of their feet to give the impression of extra height. 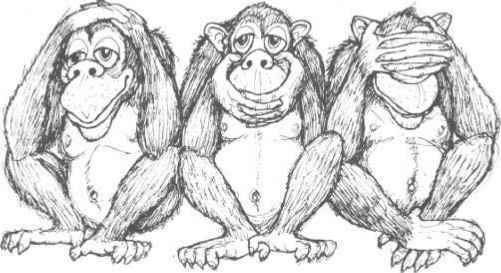 Arms folded with thumbs pointing upwards is another popular thumb gesture position. This is a double signal, being that of a defensive or negative attitude, (folded arms) plus a superior attitude (displayed by the thumbs). 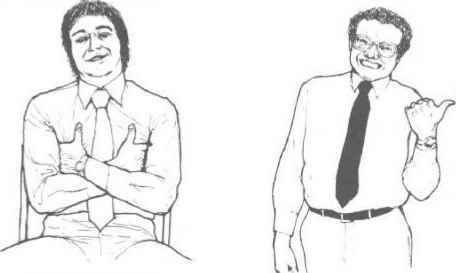 The person using this double gesture usually gesticulates with his or her thumbs, and rocking on the balls of the feet when standing is common. The thumb can also be used as a signal of ridicule or disrespect when it is used to point at another person. For example, the husband who leans across to his friend, points toward his wife with a closed fist thumb gesture and says, 'Women are all the same, you know', is inviting an argument with his wife. In this case the shaking thumb is used as a pointer to ridicule the unfortunate woman. Consequently, thumb-pointing is irritating to most women, particularly when a man does it. The shaking thumb is less common among women, although they sometimes use the gesture at their husbands or at people they do not like.